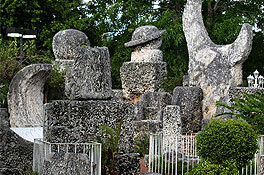 The Coral Castle, located in Homestead, Florida is one of the most amazing modern structures ever built. 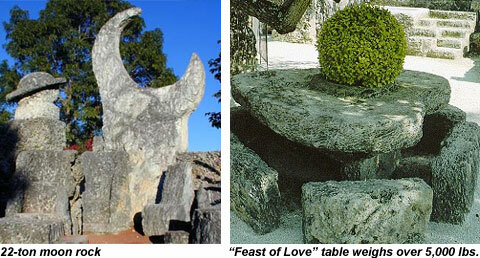 The castle has been compared to Stonehenge, ancient Greek temples, and the great pyramids of Egypt. It is estimated that over 1,100 tons of coral rock were used to create the walls, towers, art objects and even carved pieces of furniture. What makes this castle so amazing is that is was constructed by one man, Edward Leedskalnin, a 5ft tall, 100lb Latvian immigrant. 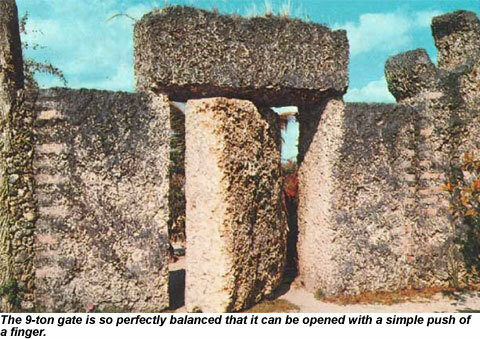 He quarried, fashioned, and transported these megalithic blocks of coral rock, some weighing as much as 30 tons, setting them in place without assistance or the use of modern machinery. As the story goes, Edward Leedskalnin was left standing at the alter by his ‘sweet sixteen' fiancé, claiming he was too old and too poor. He was supposedly so deeply devoted, heartbroken and still in love with this young girl, that he dedicated the rest of his life building a castle in her honor in hopes of one day perhaps she would come back to him. After leaving Latvia, Edward wandered around the U.S. and Canada for several years, finally settling in Florida City after being diagnosed with tuberculosis. He allegedly spontaneously healed, stating that magnets had some effect on his healing. Working alone, Edward labored for 20 years (1920 to 1940) building the home he originally called 'Rock Gate Park' in Florida City. He began building his coral home in 1920. Then in 1936, for reasons still unknown he moved his entire home 10 miles to Homestead, Florida, where he completed it, and where it still stands as a tourist attraction. This move took him 3 years. How Leedskalnin worked has never been discovered, though he labored for over 20 years. He was believed to work only at night hidden from the eyes of the curious observers. Some suggest that he used a form of anti-gravity device to build the castle. Numerous designs have been suggested for this device, some using 'harmonic sound waves', some using magnetism, and numerous other proposals. Leedskalnin was said to be a student of the universe. 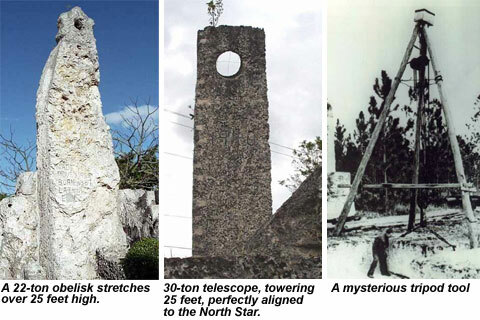 Much of the Coral Castle site is calibrated to celestial alignments. Since Ed believed that the entire universe was made up of magnets, he deduced that if he could harness the flow of these magnets that flowed in and out of the Earth, and through all objects, he could use that force to manipulate matter to his advantage. This 9-ton gate is so perfectly balanced that it can be opened with the simple push of a finger. It closes to within a 1/4 inch on either side of the frame opening. It broke in 1986. Six men and a 50-ton crane were needed to remove and repair it. What they found was that Ed had centered and balanced it using an iron shaft and truck bearing. He drilled an almost perfect round eight-foot hole for the shaft using only hand tools. Today a laser-guided drill bit would be used to achieve such extreme precision. State-of-the-art adhesives were used when reinstalling the gate. Edward wrote a book in 1945 about his knowledge of the blueprints of all creation. On the cover of Leedskalnin's book is the clue to the blueprint of nature's two magnetic currents that are the base of all structure and creation in our Universe. Ed knew about the ancient science of Sacred Geometry which represents the knowledge of two magnetic currents and the neutral particles of matter that orbit as a common core. This code clue has been left behind by many ancient cultures such as the Golden Section, Golden Ration, Phi, Flower of Life, and Time Measurement as well as many others. This clue of the two magnetic currents that Ed put on the cover of his book is the key to opening one of the most sought after mysteries of the world, these two magnetic currents that form all of nature. There is also another underlying pattern within this code that is known as Ley lines. Ley line is a neutral energy distribution line. These are the true atom builders. All of the above mentioned sacred geometry is really representing two individual magnetic currents. 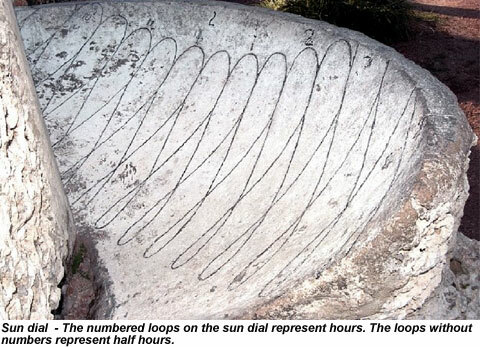 Ed Leedskalnin showed every indication of being a natural geomancer - one who senses the unique telluric forces of the Earth. He was highly intuitive, and knew how to observe nature for signs of anomaly. This ultimately led him to the discovery of vortex energy, and the ability to harness the natural elements of magnetism. His work demonstrates that there is no such thing as an electron or electron cloud. An electron cloud is caused by a disturbance of the steady state nucleus of an atom by bombarding it with neutrons (or individual magnets) in the used methods and techniques of atomic observation. This formula of all energy and matter includes every single thing that exists including you. On the cover of Ed Leedskalnin's book are two individual magnetic currents. The simplicity in these two currents will blossom into glorious complexity that becomes a blueprint of our universe and it's base form of energy and how it's very elastic magnetic current tentacles stretch out in vortex motions. It is the construction and destruction process within the fabric of creation. Ed Leedskalnin said that sciences theory that, 'energy is canceled when positive and negative connect', is false. He states that only North and South whirling against each other can run, they run in a screw like twisting motion (vortex motion). The Vortex motions are throwing out individual North and South magnets, the magnets that are lost are instantly replaced. North and South come back to their own kind of magnet, rejoining the individual perpetual orbits. The metal is not the magnet substance; it is just holding more magnets flowing through it than other things. Magnetic currents flow through metal easier than the air. Magnetic energy flows through everything, but each and everything allows different amounts of it.